Bitcoin has in the past few days, formed a clear reverse head and shoulders pattern, that finally ended in a spike up to the new Bitstamp weekly high of $2,628.67. This was an almost 19% gain from the previous sideways trading range, that was confined to movements between $2,219.02 and $2,401.93 respectively. Regardless, this is still lower than the prior monthly high of $2,789, which was realized more than 4 weeks before on June 21. 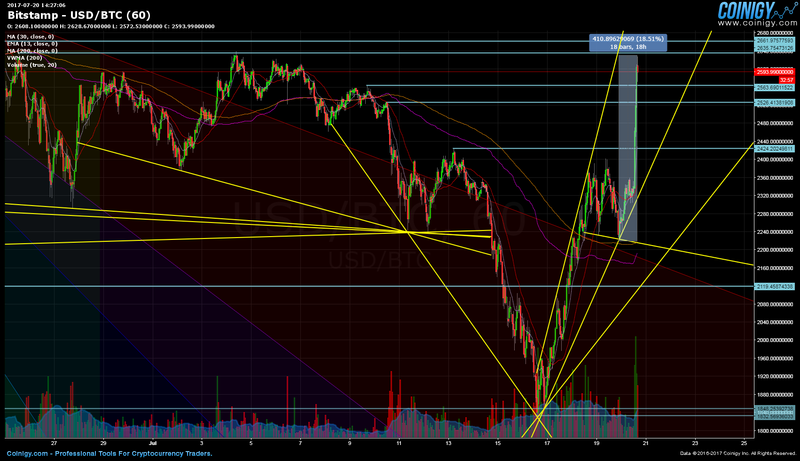 On the other hand, we may see a breakout above this level, if volume continues to pick up and increase further. We could be in for one or even two forks of the existing bitcoin blockchain. There are presently 4 node types operating independently: Core, UASF (BIP 148), btc1 (segwit2x) and ABC (UAHF). As to how this will affect trading, further reading on the ethereum and ethereum classic split may prove educational. Nonetheless, caution is advised due to the complexity, and possibility of there being two forks in close proximity of each other, instead of just one. Coinbase has appropriately alerted all of its users about both the UAHF, and USAF forks. There has been some backlash in regards to these announcements, mostly from media outlet Natural News. Even so, Coinbase has posted an official FAQ on the matter. Preparations are underway on other sites as well, such as BTCC and Yobit. YoBit is ready for Bitcoin wallet update (1 or 2 forks). Btc deps/wds will be disabled on 31 jul – 1 aug.
Business Insider reports that Goldman Sachs is highly bullish, citing that we could see a retest of the all-time high, and levels beyond even $3,000. Not exactly sure how a four-fold split of the community will bring about such a dramatic rise, although higher highs are likely up until the actual fork events. Likewise, there has been additional coverage from a CNBC article concerning bitcoin miners, as well as a second one noting Swiss legislation in detail. Ethereum was also hacked again; another possible hard fork may be imminent here too. Bitstamp’s US dollar/bitcoin pair reached a new weekly low on July 16, settling at $1,830 (GMT 10:00). It was the start of a powerful upturn, that halted short of $2,400 on July 18 (GMT 18:00). However, after practically 2 days of intense sideway trading, there was a strong explosive push to the new weekly high of $2,628.67. If you have any questions or comments concerning bitcoin, please feel free to use the form below and reply or comment.